Here is Bangla friendship day sms. Next Happy Friendship Day at 30 July 2019. In this day all best friends in the world arrange special moment to celebrate this occasion. In Bangladesh also celebrate this day with the joy. This day is very special for them, who are really like to make good friendship. They spent good and amazing time with their best friends in this “Happy Friendship Day” occasion. Almost every friends liker people send wish their friends with bangla friendship day sms in this great day. 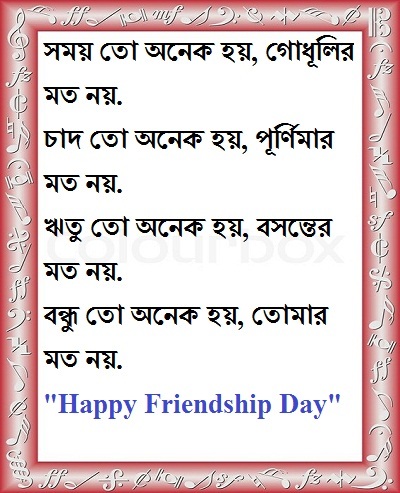 But there is but enough bangla friendship day sms in the internet. As a result, many people search in google for finding the best, new and romantic sms to Google. Hello dear friends, today i am sharing in this site some beautiful and romantic bangla friendship day sms, you can share this sms with your best friends and with your girlfriend. I also wish all of you ” Happy Friendship Day “. If you send these sms to your friend, they will be so happy. Because all sms are very nice. 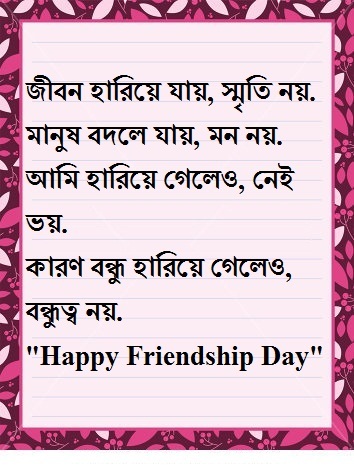 So my dear friends i have shared here some good bangla friendship sms to celebrate this Friendship day with your friends, Also here you will get some amazing picture or images about Happy Friendship Day. All are free of coast. You can share this sms messages and images with your friends at Facebook, Twitter, Instagram or anywhere you want. Golap jodi lal hoy ,Megh hoy kalo. Pakhi jodi gan gay,Surjo dey alo. Tumi jodi bondu how bashbo anek “VALO”. Bondhu mane duti hridoyer tan. Bondhu mane sukh dukher gan. Bondu mane duita jibon ar ekta jeno pran. tomar sathe amar ki kokhono hobe na dekha.? Nil chara akash sundor noy. Dhew chara nodi sundor noy. chad chara rat sundor noy. bondhu chara temni jibon sondor noy. One two three, Friendship a nai sorry. Four five six, Bondhu 2mai kori miss. Seven eight nine, Bondutte nei mind. One ziro ten, How r u friend?? Jibon Hariye Jai, Sriti Noy. Manush Bodle Jai, Mon Noy. Ami Hariye Geleo, Nei Voi. Karon Bondu Hariye Jai, Bondutto Noy. Ek sohore Love & friendship bash korto. Ek din tara rasthay hatchilo . Hotath love drain e pore gelo, kintu friendship jump . b’coz love is ondho & frndship is powerful!! shomoy to onek hoy, godhulir moto noy. chad to onek hoy, purnimar moto noy. ritu to onek hoy, boshonter moto noy. bondhu to onek hoy tomar moto noy…..! bondhutto onek mojar, jodi bondhutto korte jano. jokhon nijeke osohay mone hoy. karon sondeho theke jonmo ney obissash. 1 jon chirodin tmr pashe roye jabe. Sei holo tmr prokito bondhu. hat tar osru muche dey.